The passing of Willard Allen Leslie, husband of M. Elaine (Calder) Leslie of Leonardville NB occurred unexpectedly at the Saint John Regional Hospital, Saint John NB on November 19, 2018. Born in St. Stephen NB on July 27, 1940, he was a son of the late A. Osgood and Effie (Doughty) Leslie. A loving husband, father, grandfather, great-grandfather and brother, in addition to his wife, Elaine, Willard is survived by his sons: Allen Leslie (Ted Jones) of Saint John NB, Anthony Leslie of Saint John NB, Grant Leslie (Averosa) of Lords Cove NB and Brian Leslie (Elvie Suyat) of Blacks Harbour NB; grandchildren: Kayla, Justin and Akira; two great-grandsons: Levi and Theo; one brother: Roger Leslie (Peggy) of Fairhaven NB; sisters: Ruth Lyons of Calais ME, Muriel Estabrooks of St. Stephen NB and Katherine Conley of Portland ME; numerous nieces, nephews and cousins. Besides his parents, Willard was predeceased by his brothers: Maxwell and Stanley Leslie; sisters: Doris Cogswell, Betty Heywood and Ida Leslie. Willard was known as a "jack of all trades" among his family. He drove truck for many years and also enjoyed fishing. He loved music, especially Country and he had a passion for sports. He loved Hockey and in his younger days was a former Captain of the Deer Island Islanders. A people person, Willard had the ability to make friends wherever he went, and his friends quickly became family. 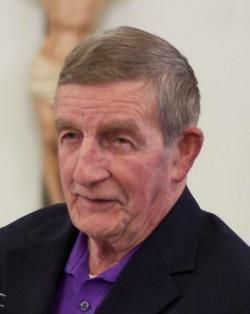 He was a longtime member and Deacon of the Leonardville Church of Christ. Always smiling, he brought joy to those around him and his humor, love and heart of gold will be greatly missed by his family and many friends. Arrangements in the care of the St. George Funeral Home (755-3533) 26 Portage Street, St. George NB. There will be no visiting. A memorial service will take place at the Leonardville Church of Christ, Leonardville NB on Friday at 2:00 pm with Rev. Jonathan Hatt officiating followed by the interment at the Fairhaven Community Cemetery, Calder's Head NB. In lieu of flowers, donations to the Leonardville Church of Christ, Charlotte County Cancer or to a charity of the donor's choice would be appreciated by the family.